The Dannevirke Tigers Rugby League Club are enjoying a resurgence in teams and outstanding success in their Manawatu competition. From just one team in last year's Manawatu rugby league competition, the Tigers have clawed their way to the top this season. "Last year our club had one team in the competition, an Under 11 team, but this year we've nine teams, including a men's and women's. And we've a Tigers netball team now as well," Belinda Crosswell, manager of the Under 11 team, said. 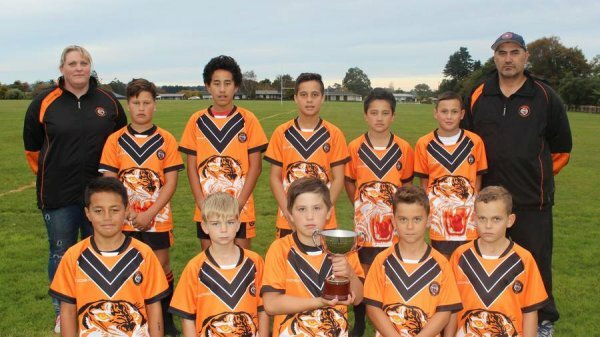 In a stunning end to the Sunday mini-mod competition, the Tigers Under 11 team won the Manawatu Rugby League's Alex Whaiapu Memorial Cup after winning all their games in the mini-mod competition which began in March in Palmerston North. Along with the Under 11 team, the Tigers fielded a Under 9 and two Under 7 teams in the competition. The two Under 7 teams made it through to the finals and played each other in the finals with the Tiger Cubs victors, winning the George Rata Memorial Cup. Not to be outdone, the Under 9 Tigers won the Mike Haddon Memorial Cup, making it a clean sweep for the Tigers Club. "Our club transported the kids in buses, thanks to funding from the Infinity Foundation which also provided new uniforms," Crosswell said. "We've also had great local support from Derek Rose with buses and Caltex Westlow who provided the mini vans." And while their rugby league competition is at an end, the young players won't be letting up, stepping up to play in the JAB rugby competition which begins tomorrow. But it isn't all over for the victorious Under 11 team who will compete in the New Zealand Maori Rugby League tournament in Whakatane in September, along with the club's Under 13 and Under 12 teams. "This is the first time Dannevirke Tigers have put teams into this competition and they'll start training again in July," Crosswell said. Meanwhile the Tigers Under 13, 15 and 17 teams are all playing in the quarter-finals of their competition in Manawatu this weekend.